I just purchased my second Fulton Standard Size mail box. First one (4 years old) was destroyed by the DOT Snowplow in January. Both are exceptional quality, made in USA and an excellent value for the money. Only complaint I have with both boxes is the flag mounting/operation. Seems the flag is simply raised and/or lowered; with no locking mechanism to hold it in the UP position. Here on the Rappahannock River in Virginia, the North wind blows hard enough at times to blow down the flag from the raised position. I plan to modify the second box with an adjustable SAE machine bolt that can be tightened to alleviate the problem. In the development where we live, all the mailboxes are identical Standard Post Mount Mailboxes by Fulton. The boxes are mounted elaborately on decorative posts and have attached newspaper holders When our original box was hit this winter, I wanted the exact replacement so that I would know that the mounting hardware and newspaper holder would fit. This box IS the exact replacement and as a result everything went together easily and I had the new box up quickly. This mailbox is not fancy or particularly heavy duty, but even so relatively good value for the money ($22). Two suggestions for improvement: (1) over time the "stop" that holds the flag horizontal gets bent and sloppy. To get around this I have installed my own "stopping post" on the side of the box. (2) Shipping/handling was more expensive than I thought it should be. However, since I wanted the exact replacement, I was willing to pay it. All in all I am happy with the product and experience. I have purchased at least 5 mailboxes in the last few years that all looked nice but were junk. They had terrible latches that left my man blowing all over the place after the door opened in the wind or were made of brittle plastic. This is just what I was looking for - A nice simple, but attractive, mailbox. Very easy to install too. This mailbox is perfect in size and matches the others we have in our condo complex. Good product. Simple , unpretentious, and made in the USA. What more could you want in a mailbox. More colors would be cool. 1st box lasted about 20 years. The replacement was a perfect fit. The only problem was removing the screws, the heads broke off. I had to drill them out and retap the holes. Color change from the standard brown of previous orders was a surprise but I can live with it. I'll still continue to order them. Solid and well priced, but installation is a pain! 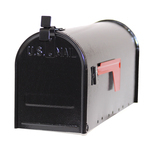 No drill holes or mounting hardware is sold with this mailbox so be prepared to drill and reuse hardware if possible from your old mailbox. Have good steel drill bits and measure twice before drilling.